Reunion Church was started in 2016 by Mike and Jessi Rigdon. The Rigdons have been in ministry together since their days as high school sweethearts and have always had a passion for creating space where people can live in authentic community, pursuing Jesus together. 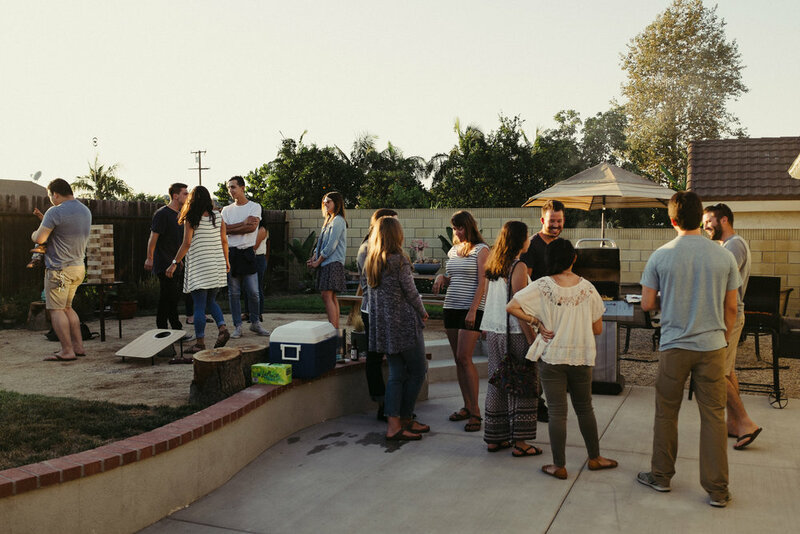 In 2014, they felt the call to start a church in the city of Santa Ana, and thus Reunion Church was born. The inspiration for Reunion comes from the story of the Prodigal Son found in Luke 15. It’s a beautiful story, culminating in a counter-cultural reunion between a Father and his wayward son, where the son is unexpectedly welcomed back to his rightful place in his Father’s home. At Reunion Church, we long to see people experience this kind of radical Reunion with their heavenly Father, finding their unique place in the family of God. That’s cause for celebration! “We must celebrate with a feast, for this son of mine was dead and has now returned to life. He was lost, but now is found.” So the party began. We look for God’s mission in everything we do. We believe that every single Jesus follower is called to be a missionary where they life, work, or go to school. We reflect Jesus wherever we go, and we long for others to know him. We believe God wants to use us to love the hurting and broken around us through proclaiming the Gospel. We seek to call those who have known the Gospel into the challenge of living it out. We don’t wait for people to come to us, rather we go to them, because Jesus meets us where we are. We are a home for EVERYONE. No matter who you are, where you come from, or what you believe – we are a place you can call home. We desire to be a house where people come from all different cultures, ethnicities, and belief systems to encounter the love of Jesus, community, purpose, and life change. We don’t have to pretend that everything is okay all the time. We are also a family that rejoices with those who rejoice, and weeps with those who weep. We take the Great Commandment literally: Love your neighbors as yourself. We believe the best way to love them is to know their names, pray for them, and look for opportunities to serve them. We take the Great Commission literally. We are committed to making disciples that make disciples so that the world can be blessed and filled with God’s glory. We are also a sending church. We believe everyone has a unique gift that God has given them. We seek to foster an environment where people can discover their gifts and become the people God has called them to become, both within the church and in the community. We seek to be a community where we all have everything we need. We believe that everything we have is from God. We also believe that the church is at its best when we give our lives over to one another. This includes the sharing of all our resources – time, money, and belongings. The Gospel is a story of “good news.” Thousands of years ago, God created this world and everything in it. He created people, men and women like you and me, so that they would know Him and be with Him. But God’s people quickly turned their backs on Him and chose their own way. When they did, a new reality of darkness and distance from God ushered in. However, God set a plan in motion to reclaim this creation that He loved and longed to be with. He sent His Son, Jesus, into the world as a way back to Himself. Through His life, Jesus taught us what God is like. Through His death, He took the judgment for our rebellion. Through His resurrection, He opened the door for us to have life with God for all of eternity. And now, through His Holy Spirit, He continues to draw people into His story and make their lives new. The Bible, God’s Word to us, is central to our relationship with God and each other. While there are some areas where Christians agree to disagree [Romans 14:1-15:7; 2 Timothy 2:23-24; Titus 3:9], the Bible makes clear that certain truths are essential convictions of the Christian faith. WHY DOES IT NEED TO BE LIVED OUT? The Gospel is a story that changes lives. For centuries, this story has rescued all kinds of people from lives of brokenness and has brought hope, meaning, and newness. In view of that, this is not just a story to be told. As we continue to encounter the Gospel and find our place in it, we want to live in light of its hope and promises. This means that we see our place in the world through a new lens – as men and women who show the people around us what the Author of the Gospel story is like. The Gospel is a story of togetherness. God did not create us to be alone. He created us for community with Himself and with the rest of His creation. So as we find our place in this story, we don’t have to live it out by ourselves. God has given us one another with the intent that we would do this together. Not only does that benefit us, but as we step into the kind of Church that God wants us to be, we want our love for each other to represent Him to the world in compelling ways.